"Most mosquito bites happen in homeowners' own yards." 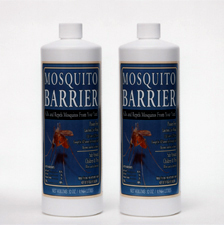 Mosquito Barrier is a very strong liquid garlic made from very potent garlic cloves. The garlic used in Mosquito Barrier is a very powerful variety which is much more potent than the garlic found in grocery stores (in fact, our lab people here refer to it as "super garlic"). 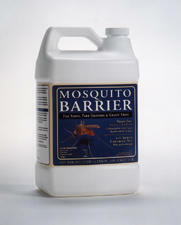 Click here to see a scientific analysis of Mosquito Barrier. Garlic has a natural sulfur which repels mosquitoes. Spraying garlic to keep insects away is not something new, farmers and master gardeners have been doing it for many generations. Additionally, Mosquito Barrier, when mixed with canola oil (available at your local grocery store) plus the water, coats any standing water in the area with a very thin film of natural oil. This oil suffocates the mosquito larvae which can develop in standing water. Unlike harmful chemicals, Mosquito Barrier is a natural insect repellent that doesn't kill bees or butterflies and is completely safe for children, fish, birds, dogs, cats and other pets. 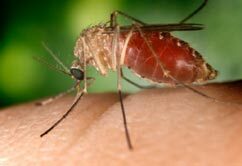 Be careful of traditional chemical pesticides, they can kill more than mosquitoes. Read this to learn more. Each quart covers 1.25 acres, which is usually enough for a couple applications on smaller residential properties. 99.3% pure garlic extract. Twin-paks last most city residences all season. 99.3% pure garlic extract. "...the product works remarkably well." "...I was shocked at its effectiveness." "...I did use it, and it certainly does work." "The mosquitos were horrible but, I've got to tell you I haven't seen one since we sprayed. This is the first year we have been able to come home, sit outside and barbecue." "We sprayed our park and it worked!" Click here for Scientific Studies of Mosquito Barrier on Mosquito Larvae and Adult Mosquitoes. For Dealer/Distributor pricing, click the CONTACT US button at the top of the page. our Canadian distributor by clicking here. our exclusive distributors in India by clicking here.